One Eternal Day: "Bowing down in blind credulity...."
Like Chesterton’s essays, his autobiography is all over the place. The narrative of Chesterton’s life is not what drives the book, but the ideas and insights he discovered during his sojourn on earth. Chesterton makes a sideways case for the truth of Christianity by appealing to the explanatory power of Christianity as seen in everyday experience. Nobody can correct anybody’s bias, if all mind is all bias. With all possible apologies to the freethinkers, I still propose to hold myself free to think. The principal objection to a quarrel is that it interrupts an argument. There are some who complain of a man for doing nothing; there are some, still more mysterious and amazing, who complain of having nothing to do. 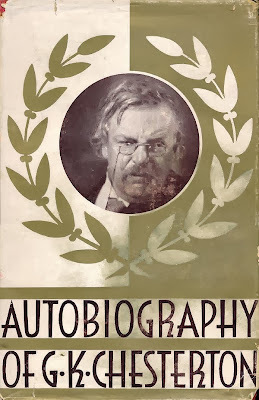 The Autobiography of G.K. Chesterton was published in the year of his death, 1936, and is not yet in the public domain as are many of his books. Trevin Wax links to an inexpensive paperback edition at Amazon. The cover above is from the book in my library, printed in 1936, but not a first edition and rather worn.